I have 16 "Translucent Blue HyperGlow Lanterns" available via a Sign Up Sale. 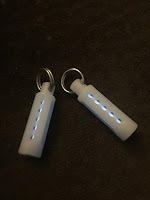 These are made from HyperGlow material, and feature an Blue 3mm * 23mm Self Lighting Gas Vial, SS split ring, and use a #8-32 socket set screw for captivation of the vial. Physical specs: .375 diameter * 1.348 in length. Winning Email notifications with payment information are sent from SignUpSale.com , so be sure to check your spam folder once the sale is over. 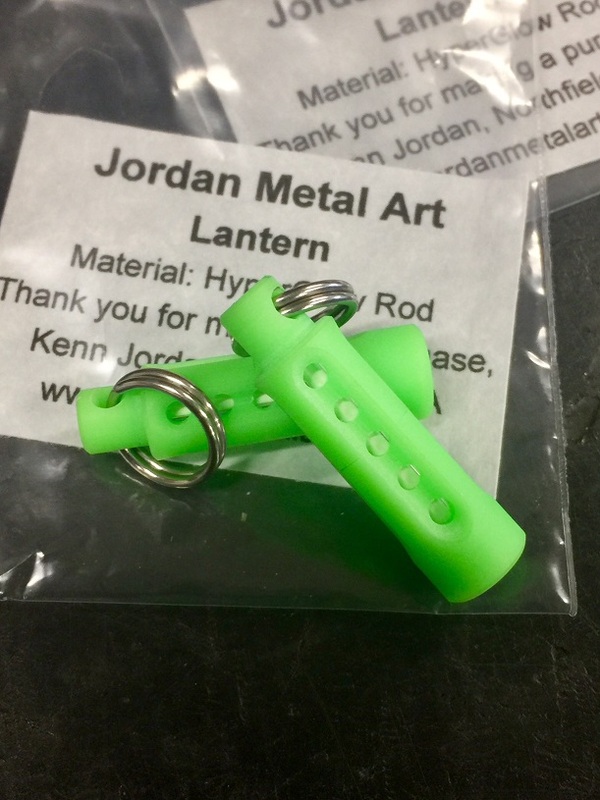 I have 15 "Green HyperGlow Lanterns" available via a Sign Up Sale. 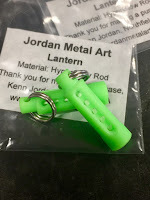 These are made from HyperGlow material, and feature an Green 3mm * 23mm Self Lighting Gas Vial, SS split ring, and use a #8-32 socket set screw for captivation of the vial. I have the last of the Lanterns for awhile ready to go via a Sign Up Sale. 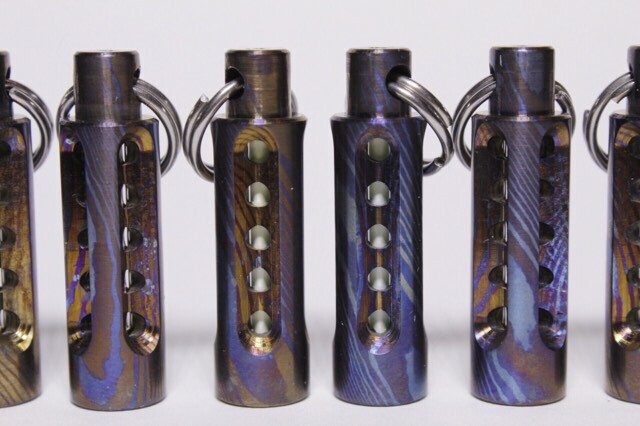 These are made from Nichols 2 Alloy Moku-Ti material, and feature a Green 3mm * 23mm Self Lighting Gas Vial, SS split ring, and use a #8-32 socket set screw for captivation of the vial. Sign up will be OPEN till 7:00pm tomorrow evening 4/3. One entry per person, and here is the LINK if you'd like to sign up for the chance to purchase 1 of the 6 available. Geez guess I stashed these "Deluxe Edition CuTecals" awhile back, and totally forgot they existed till stumbling across em this morning. Made from Tellurium Copper, and measuring .265 thick, x .625 high, and 1.950 in length. 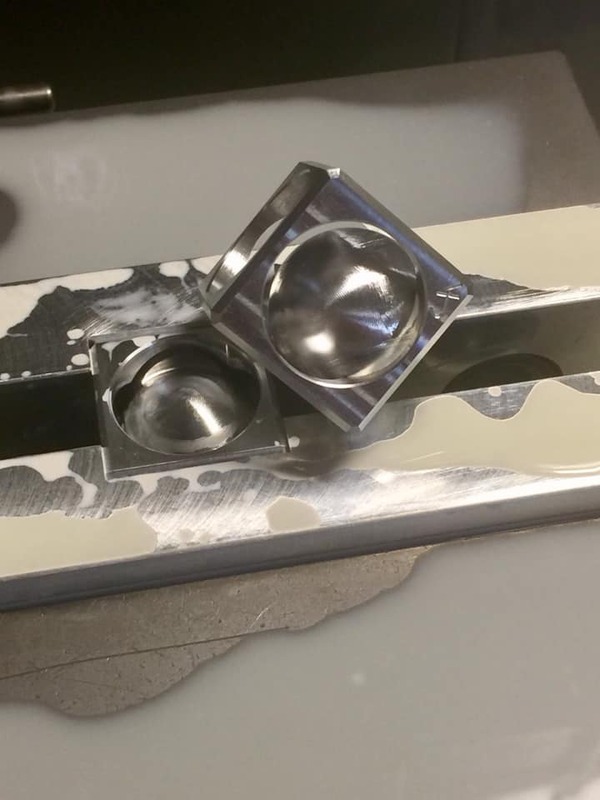 Purposes are the cap lifter, use of the thumb jimping as an assist for twist off caps. Once the sale has ended, Email notifications with payment information will be sent from SignUpSale.com , so be sure to check your spam folder. 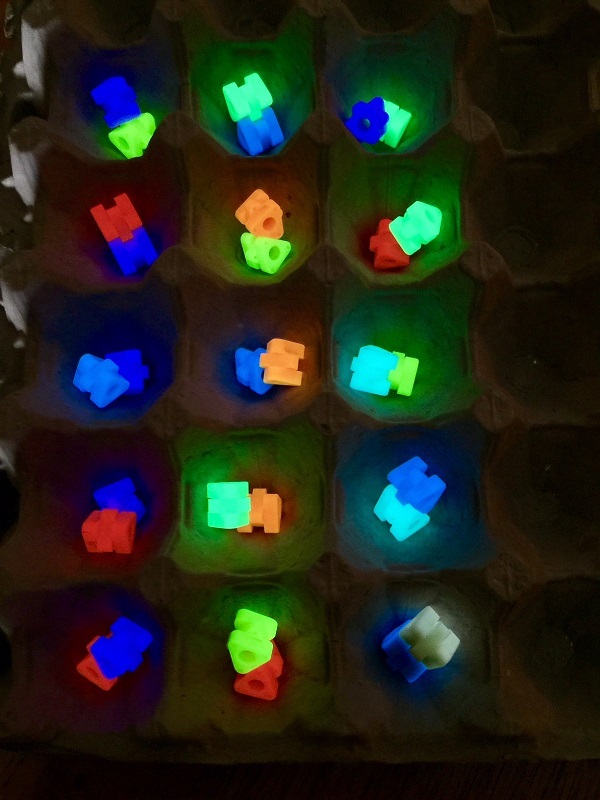 I have 6 "Lava TurboGlow Lanterns" available via a Sign Up Sale. These are made from TurboGlow material, and feature an Yellow 3mm * 23mm Self Lighting Gas Vial, SS split ring, and use a #8-32 socket set screw for captivation of the vial. I have 9 "Lime Green TurboGlow Lanterns" available via a Sign Up Sale. 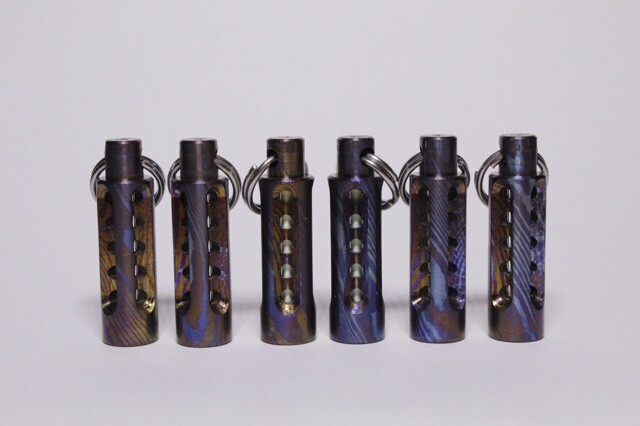 These are made from TurboGlow material, and feature an Green 3mm * 23mm Self Lighting Gas Vial, SS split ring, and use a #8-32 socket set screw for captivation of the vial. Translucent Blue TurboGlow Lantern Sign Up Sale. I have 10 "Translcent Blue TurboGlow Lanterns" available via a Sign Up Sale. These are made from TurboGlow material, and feature an Ice Blue 3mm * 23mm Self Lighting Gas Vial, SS split ring, and use a #8-32 socket set screw for captivation of the vial. 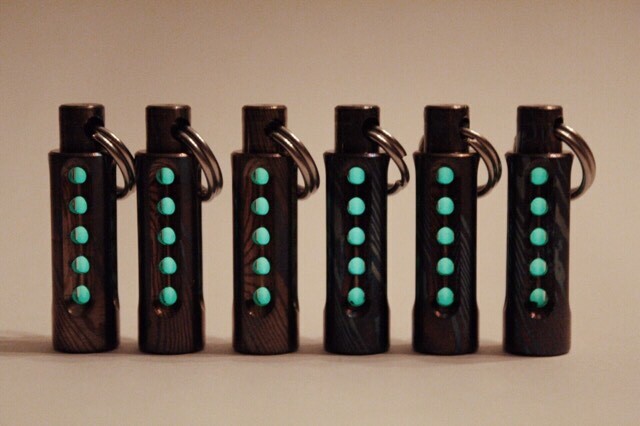 Today I have 8 Rexolights with Green vials for a sign up sale. These are made from Rexolite, and feature a 3mm * 23mm Self Lighting Gas Vial, SS split ring, and use a #8-32 socket set screw for captivation of the vial. 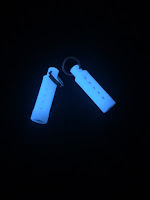 Today I have 7 Rexolights with Ice Blue vials for a sign up sale. 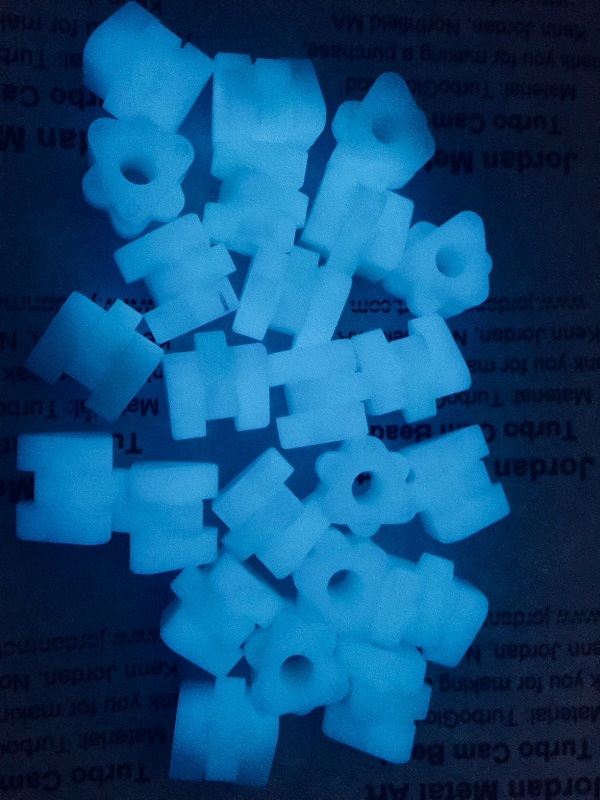 Today I have Translucent Blue TurboGlow Cam Beads for a General 1st. come 1st. served sale. 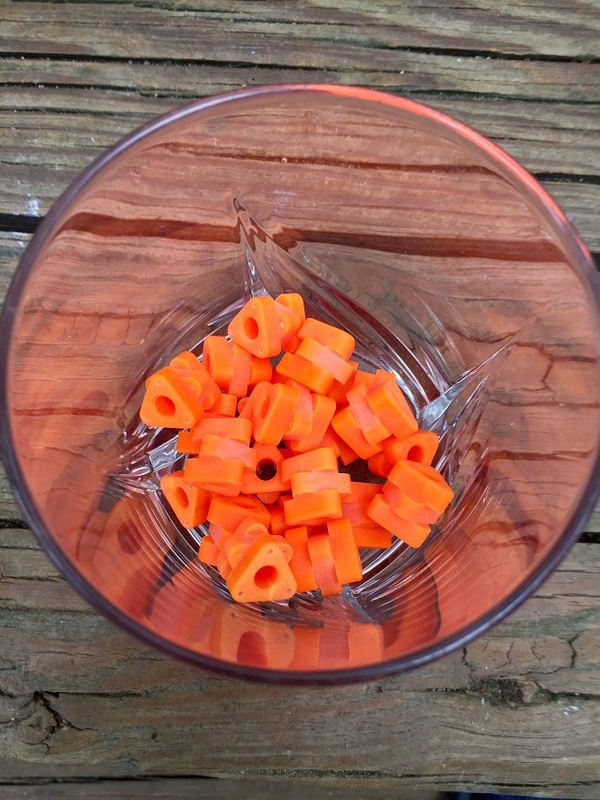 .600 diameter x .5625 in length. .201 diameter hole thru the bead center to accommodate para cord. Howdy folks, and welcome to 2019. 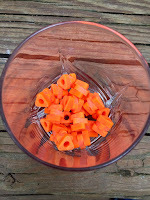 Today I have ORANGE TurboGlow Cam Beads for a General 1st. come 1st. served sale. Sign up is Closed. Thanks so much folks. Lets see if we can't squeeze one last sale into 2018 eh. 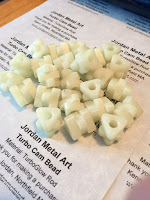 Today I have GREEN TurboGlow Cam Beads for a General 1st. come 1st. served sale. Sign up is Closed, thanks to all who made a purchase. I'd like to take this time to say a hearty thank you for your support of all things JMA this past year. 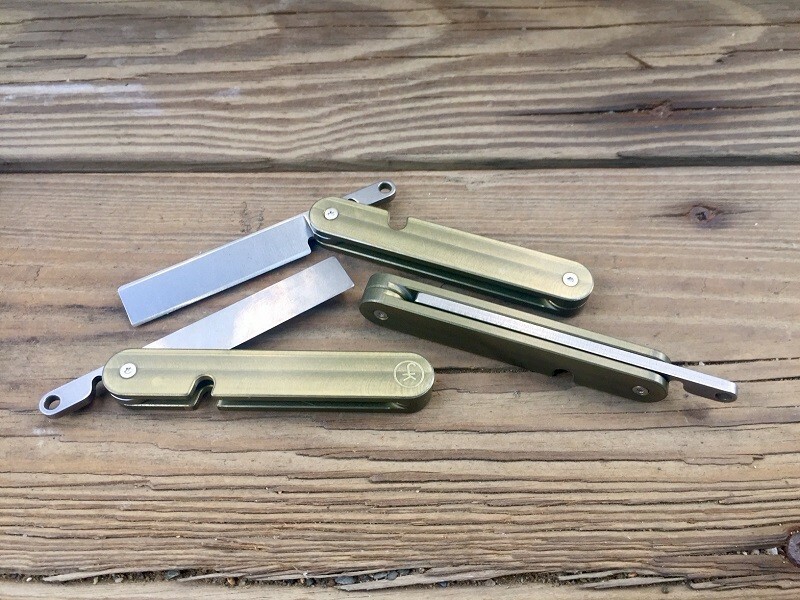 With that said, I have just one "Guilly Friction Folder" I've been sitting on for this Christmas Eve Give Away. Blades are CPM S30V, with 2" of cutting edge. 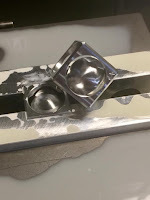 The frame scales are 3 1/4" long, and made from Nickel Silver. Overall length opened = 5 3/8". Overall length closed including thumb tang = 4". Stainless Steel hardware, and Phosphor Bronze washers. The scales are sporting a drab olive green hue. Winning Email notification will sent from SignUpSale.com , so be sure to check your spam folder once the draw has occurred. Whelp today for a Sign Up Sale I have 6 "Cube Spheres". 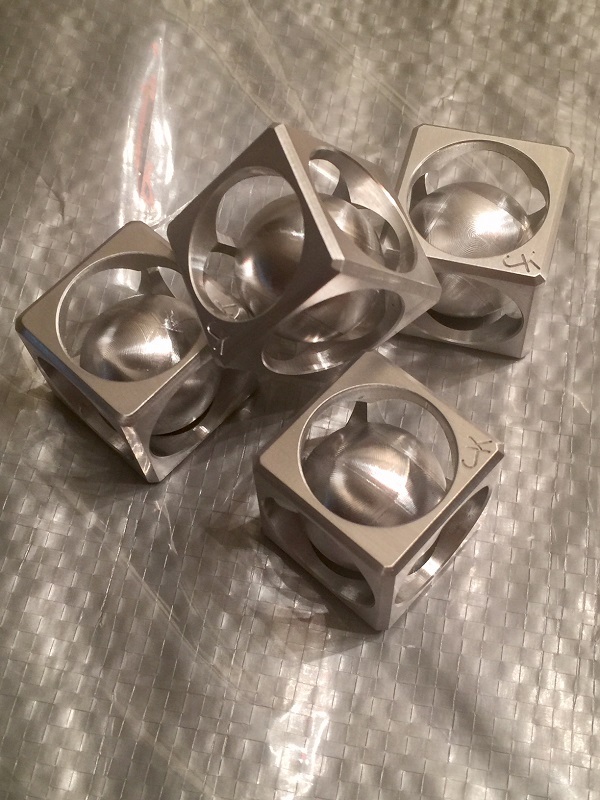 I only made a limited few as this was more of a personal challenge for myself to see if I could pull off machining a loose sphere inside a cube. 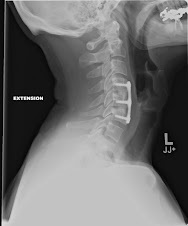 I've done several CAD designs for the CS, as well as fixturing designs over a few years playing with em off and on trying to realize the end result. I just recently settled on one I was fairly confident would work. While I'm happy to say the whole plan worked, the cycle time per piece ended up being insanely long at about 4 times longer than any other JMA cubes, hence the low quantity, and hefty pricing. Will I ever make these again? I really don't know, but if I do it won't be for a long time, and again the piece yield would be very low. 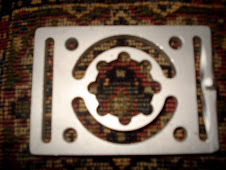 Machined from one piece of solid 6061-T6 Aluminum. 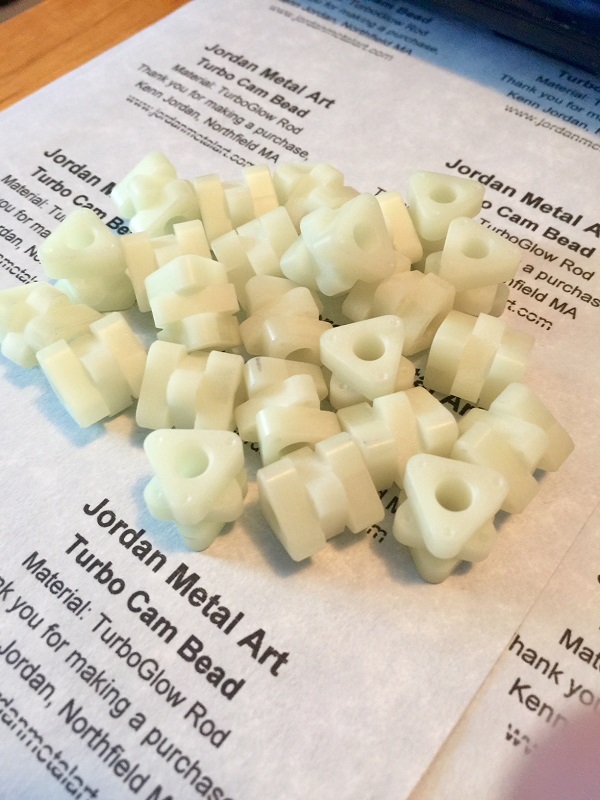 Todays Sign Up Sale is for some Cam Beads in a new material called TurboGlow. A fellow JMAer found a supplier who makes this material. He purchased several rods in various colors, and was kind enough to send them to me. Due to there being several colors, and some rods being shorter than others I ended up with varying amounts of each. For future runs, I will order several rods of each color. That being said this sales winners will get 2 beads. I have 15 sets available. 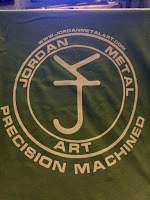 Today I'm offering Size 2X Large shirts only, and I have 18 available. 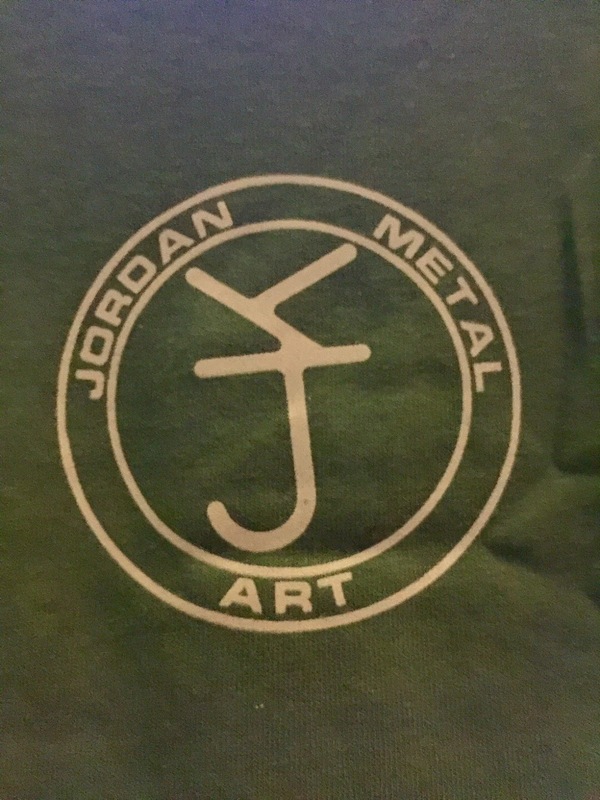 These are Gildan brand shirts in 100% cotton. This is a General sale, first come first served. Sale has ended, and Payment Emails sent. Once the sale has ended Email notifications with payment information will be sent from SignUpSale.com , so be sure to check your spam folder once the sale is over. 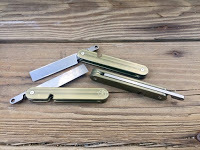 Guilly Friction Folder Sign Up Sale, Last of the First Run. 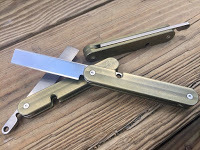 Today I have the last 5"Guilly Friction Folders" ready to go via a Sign Up Sale. Once again, the scales on these are sporting a drab olive green hue. 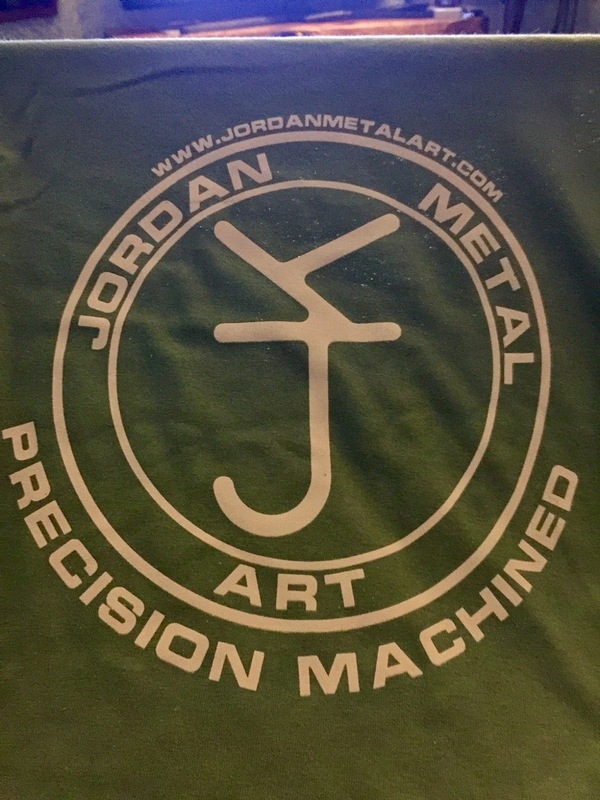 So 2019 will mark 10 years of Jordan Metal Art. To recognize this I figured it was about time to get some T Shirts made up. Shirt color is drab green, and the printing is sand colored. Today I'm offering 20 EXTRA LARGE size only. 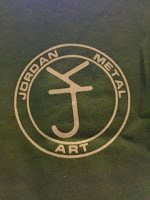 If you're interested in owning a JMA shirt please click this LINK to go to the purchase page. "JMA Supporters Photo & Discussion Group"
Sales are of a Sign Up format. When a sale is "active" there will be a clickable LINK that will take you to a sign up page. Once there fill in the requested info, and you will be entered. Upon the close of sign ups, I will then generate the winners, and Email them with payment info. I use SignUpSale.com for these sales. When you enter a sale, or win, Emails will be coming from this site, so be sure to check your spam folder. Preferred payment is Pay Pal via the GOODS option, though I'll happily accept a USPS Money Order as well. While a speedy payment is encouraged, 24 hours post sale is the limit. I will then select new winners from the initial sign up list for any items unpaid for after that time. I gladly ship the the world over, but am not responsible for any parcels once I drop them off at the USPS. 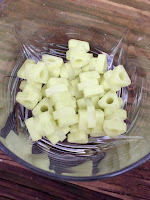 I currently offer several items through Moore Cutlery. This is the only dealer I use. Please be sure to check out other offerings there as well. 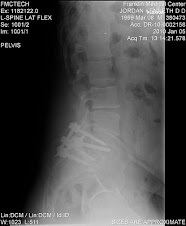 I am a 50 year old Machinist with 30 plus years experience. At the shop I work for we make everything from old tractor parts to aerospace components. I have always enjoyed making little baubles and gadgets in my spare time. I've now begun producing limited batches of my creations for the public to enjoy. Nebili SE W/ Copper Inlay, Brass Thumb Disk. 1" dia. Lucite, with a Brass cap, and 15 mm self lighting glass sphere. Yup, that's a #2 phillips bit machined on the end. 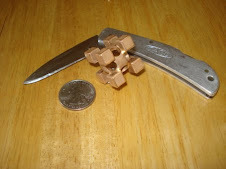 Almost two times larger than a regular triple cube @ 1.750 square, and made of aluminum and gold plated. Made from 1" Red Brass then buffed to a mirror finish. One of three made. The Case knife is a 1982 and has been my EDC since then.